Picked up a large lot of Joes last week. I got them from a local comic shop I follow on Facebook. 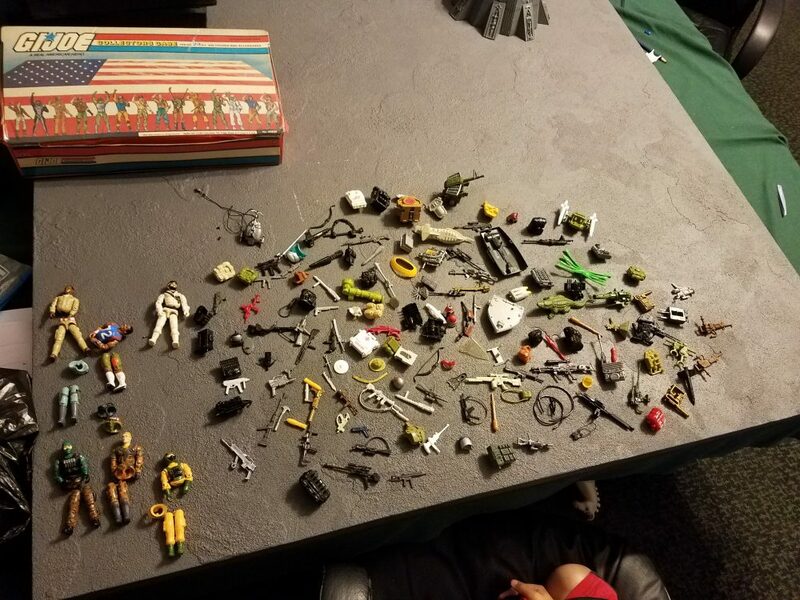 the owner posted late Last Tuesday that he had purchased a huge collection of toys. He posted one pick of Joes and I knew right away that I wanted to them. 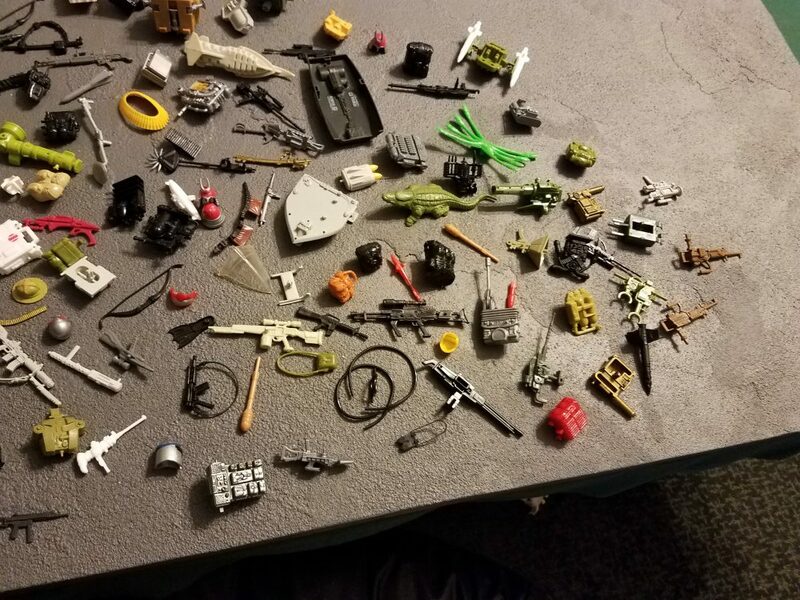 From the picture I could see some Python Patrol, Slaughters Marauders, Tiger Force, and a few other figures I was looking for. I Private Messaged the owner but he did not respond. The next morning someone had commented on the FB post that they would be their at noon/opening to buy the lot. I had to work and was not planning on taking off to go over and try and get the lot. I did not even know if he was willing to sell as a lot or if he just wanted to sell individual. So all day I was anxious wondering if I anything was going to be left. To make things even worse I had an after work meeting to attend. After I had finished up everything I headed to the comic shop, it was only a little out of the way on my drive home. The whole drive I kept saying, “lower you expectation, It may be all gone”. when i entered the store the owner had all the toy lot spread out going through it. and to my surprises the Joes where all still there. He had them laid out in the display case. He said the bottom shelf were $10 each and the top was $25. I had him pull a few out, a chuckle for 10 and a Night Viper complete for 25. I had him pull some Special Mission Brazil figures out and then all his Python Patrol. As we talked I asked if he wanted to just sell it as a lot. He said he would have to do $700. I told him that was well over my price point. He said he could do $500, and I was still like man that a bit more than I wanted to spend. I added a few more figures to my purchase pile and had him add it up. The total came out to around $345. It was only about 20% of his figures, I said “man at this point I should just buy them all for $500”. He said he would do the deal, but would keep the Hardtop and 2 Claymores. I said that was a deal. As he started loading up all the Joes, he said he would give me the Hardtop and Claymores for and extra $100. The Hardtop was not complete and the Claymores did have one helmet. It was not the best deal on the 3 figures. However I felt the the total deal was still a good one. After all was said and done the total was $651 after tax. 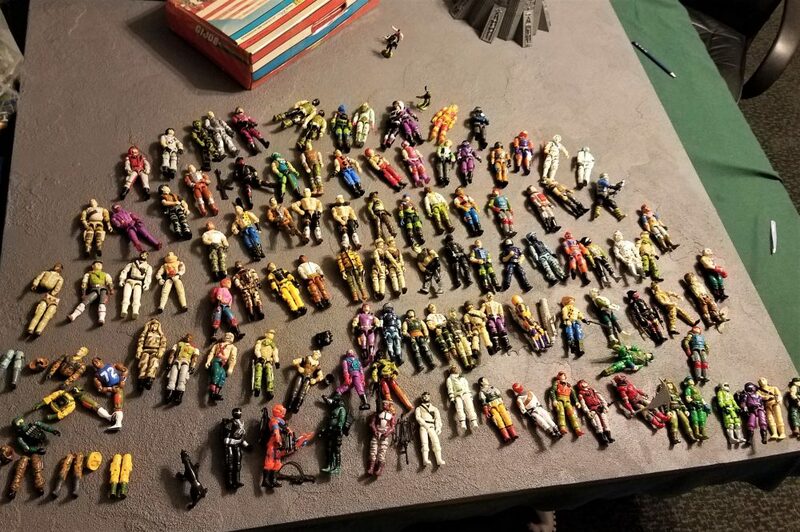 I ended up getting around 160 figures,that is $4.07 a figure. 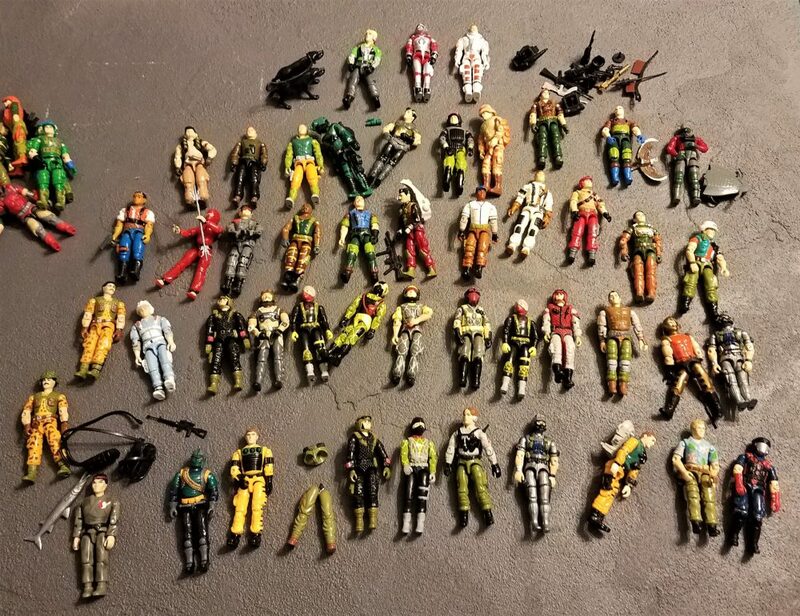 All in all a good deal figuring that most are in above average condition, many had full accessories, and it came with many rare/sought after Joes. As with any figure I compare all the parts with my figures and bash them to make the best one possible. I will then sell any duplicate figure that I have to try and recoup my investment. Well what is your openion of the haul? Did I pay too much? What Joe did you want the most from the lot?